Encrypt Files is FREE program. With Encrypt Files you can protect your files and folders from unauthorized viewing. Encrypt Files supports 13 encryptions methods. File Encryption is scrambling process in which files are made unreadable until the specific decryption method has been employed. The most common use of software file encryption is to protect your private files, documents and informations. Cryptography is an old science and it has been used for decades by governments and armies around the world to protect their confidential data. Nowadays, cryptography took its place in our computers, allowing ordinary users to use the most advanced algorithms to protect their private files. Once encrypted, your files would be unreadable. The files can be brought back to a readable state by decrypting. Encrypt Files is free encryption desktop computer software. 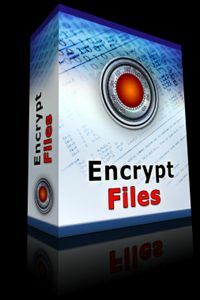 It is lightweight but powerful program that will allow you to encrypt your files and folders and password protect them. Make sure to remember your password or you would not be able to decrypt files to "normal", readable state. We believe people should have solid free alternative to commercial products. Encrypt Files does not have bells and whistles of some high priced commercial products. It is simple, reliable encryption software that will allow you to protect your confidential files. If you need more than this, take a look we reviewed some commercial products HERE. We would appreciated if you put a link on your site and help spread this utility for the benefit of internet community. Than take a look at top notch Steganos suite of programs. Those are amongst the best privacy protection solutions money can buy. Highly recommended.